Whitewater Rafting on the Clearwater River in Wells Gray Provincial Park, BC Canada! Let the excitement begin and join us on an exhilarating BC river rafting adventure on the pristine Clearwater River in Wells Gray Park. The Clearwater River is part of this future UNESCO World Heritage Site and one of the world’s great whitewater rivers known far and wide. It’s the best of the best that British Columbia has to offer and its here, right by the town of Clearwater. Riverside Adventures Ltd. makes your rafting experience authentic by offering you: smaller diversified groups, personalized guiding and safety, challenging whitewater, spectacular canyon scenery, unique wilderness and wildlife, and side hikes to waterfalls. 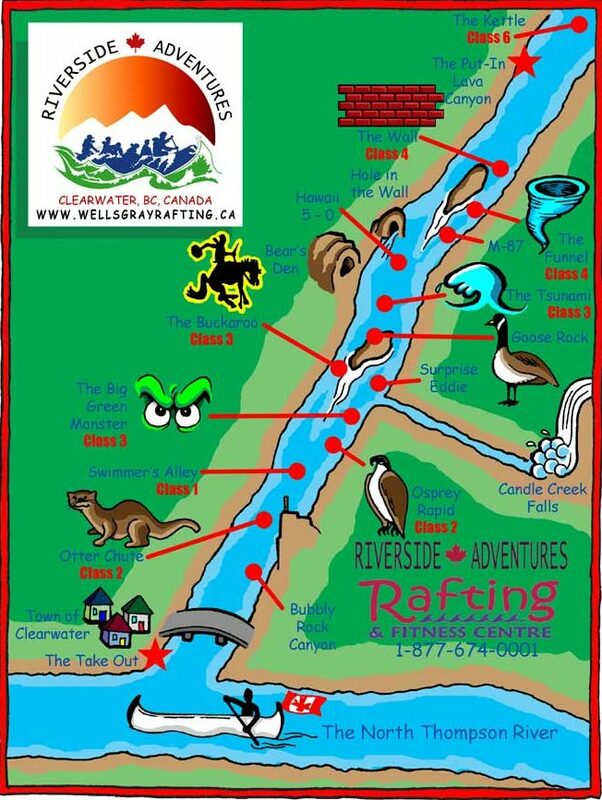 All Clearwater River rafting trips use the best river gear available and are led by rafting professionals with outstanding guiding expertise and a vast knowledge of Wells Gray Provincial Park. Also available are our two-man mini rafts: highly maneuverable and comfortable. Great introduction and the ideal stepping-stone to a more advanced river running skill development. THE MEET & GREET: You’re greeted and welcomed and then sign a standard waiver that outlines some of the risks and hazards associated with whitewater rafting. We walk together to the trip meeting location, located behind the building. SUITING UP: You’re then outfitted with wetsuits (fleeces and splash jackets are available depending on the weather conditions). We also provide shoes (or neoprene booties in colder weather) for guests who don’t have appropriate river footwear. Your clothing and valuables are stored in containers, locked in the rafting headquarters. TEAM MEETING: We do introductions with the whole group and the guide outlines the upcoming British Columbia river rafting trip itinerary which involves mostly Class II or Class III rapids, with one section of Class IV (rated according to the International Scale of 1 to 6). LOADING UP: The team moves into our air conditioned 15-passenger van. We travel out of Clearwater, heading up a backcountry road into Wells Gray Provincial Park. ARRIVAL: After a 15-minute drive, the raft mobile stops at the put-in trail where the team exits the van and put on the final and most important pieces of our gear; the Personal Floatation Device (PFDs) and river helmets. THE PUT-IN: Then the raft is carried down to the put-in, which is located BELOW the Kettle, a famous Class VI rapid. There is a personal introduction to the river as the guide encourages the team to get their wetsuits wet and feel the river’s temperature. SAFETY TALK/ORIENTATION: The guide outlines the protocols that will be followed to ensure that everyone has a safe and pleasurable raft trip on Clearwater River. The guide also explains how everyone works together as a team to propel the raft down the Clearwater River (if you prefer, some seats do not require you to paddle). THE FIRST FEW HUNDRED METERS: Provides some friendly water where you have an opportunity to practice the paddling commands. Then, the excitement begins as the raft rushes by an island through the first rapid. THE WALL & THE FUNNEL CHUTE: While these may not be the biggest waves on the trip, these wild waves are certainly the most technical sections, where the team has to work to avoid certain river hazards. THE HOLE-IN-THE-WALL AND THE BEAR’S DEN: These interesting features follow the first rapids and they are the results of the forces of high water erosion. HAWAII 5-0, TSUNAMI, AND BUCKAROO: Then, we are back into some of the best waves of the trip. These are famous for continuous explosive Class III breaking and standing waves. The Super Screamer seat is a must-try in this section! SIDE HIKE (spring & early summer): To Candle Creek Falls where we can actually walk right behind the majestic water curtain and, at the right water levels, jump right into the rushing pool of water. It is often a highlight of the whitewater trip from Clearwater. THE BIG GREEN MONSTER: A wild train of waves which is really worthy of its name! OSPREY RAPID: This set of waves is identifiable by the active osprey nest at the beginning of the rapids. RIVER SWIM: This is a nice section of Class I rapids where we invite the guests to jump into the river and experience some of the waves up-close and personal. This is of course fully optional and is done by floating on your back, feet first, connected to each other by holding hands, while timing your breathing at the bottom of the waves. OTTER CHUTE: This is the final stretch of rapids which has an awesome wave train at lower water levels. CLIFF JUMPING: At Bubbly Rock Canyon, we invite you to leap from an 8 meter (25-ft.) high cliff. This is done during the months of August and September, when the water levels are more suitable for such an activity. THE FINAL STRETCH OF RIVER: By this point in the river trip, we’re happy to enjoy a peaceful moment meandering down the river canyon while slowly traveling out of the Park into the town of Clearwater. TAKE OUT: Shortly after rafting under the bridge, prior to the North Thompson River, we bring the boat to rest and walk back 200 meters to the trip meeting location where our dry clothes are waiting for us. CELEBRATION: We get changed out of our wetsuits; have a cold drink, exchange river stories, and funny anecdotes. Our knowledgeable staff is also happy to give out information and maps regarding other adventures in Wells Gray Park. We offer two regular departures at 9:30 am and 2 pm daily, please call us if you have additional questions or would like to make a reservation. Call or email soon! Trip fares are refundable if reservations are cancelled in writing by email at [email protected] (or by calling 250 318 5223) up to 16 full calendar days before your river trip departure date (10% administrative fees withheld). If canceled in between 9 and 16 full calendar days prior to the trip departure date 50% will be refunded. No refunds will be given for any reason if cancelled within the 8 full calendar days after your cancellation email prior to your trip, or for any “no show” upon scheduled trip departures. Cancellations have a deep impact on small businesses as ours, therefore if you possibly foresee the need to make changes due to unfortunate circumstances, we do recommend travel insurance. Water levels and other factors such as condition of road access and extreme weather patterns fluctuate throughout the season, and may effect the river section we are able to run. We reserve the right to alter whitewater river trip itinerary (from the Clearwater to the Upper North Thompson) or to other local river sections due to circumstances beyond our control and/or for the safety of the guests. All river trips run rain or shine. Canoes and related equipment are available for rent by the day or week for you to paddle the amazing Wells Gray Country lakes. Recreate the pioneer experience by paddling this heritage waterway listening to folklore stories of early explorers and Hudson Bay Company history. Stretch out, relax, and enjoy a scenic, historic route.